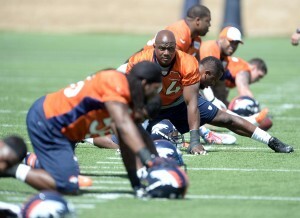 On any given weekday you may find DeMarcus Ware sitting quietly on a couch in the team locker room out at Dove Valley. He is soft-spoken, polite and his words are always measured and concise. Although his towering, trim frame suggests otherwise, his personality does not seem fit the mold of an offensive line-wrecking, quarterback-pummeling defensive lineman. Yet, as soon as you get him talking about the art of the pass rush you know why he has been so successful. As he continues on to the playoffs in his tenth season, Ware has rejuvenated himself. He finished the regular season with 10 sacks and he attributes his length in the NFL to his passion and study of current and past pass-rushers. From Deacon Jones to Dwight Freeney, Ware takes something from all of them and implements it into his game. The process has worked for Ware as he sits 14th all-time in career sacks with 127. “I got my little stab from Jason Taylor, I got the club from (Michael) Strahan, the spin from Dwight Freeney, I got the scissors from Greg Ellis. I mean every guy I emulate. I got the chop from Bruce Smith but I can’t club like Reggie White,” Ware said in early December as he rested after a practice session. Ware seems to possess little ego outside of his self-proclaimed nickname of “sack-master” and when it comes to honing his craft he can name any great pass rusher, past or present and dissect what makes them successful. It is easy to see on Sundays that he can take the best of his predecessors’ moves and set up opposing offensive tackles for failure. “You have to set them up like a chess match. Some of them (plays) you know you’re not going to win but you know you have to set them up for later,” Ware stated plainly. In week seven, Ware did just that. He made Pro-Bowl tackle Joe Staley look ridiculous when he faked a spin move and freely sacked Colin Kaepernick. He had bated Staley throughout the game and was waiting to use the incredible move. Ware joined the Broncos this offseason after an injury riddled 13-game season with the Dallas Cowboys. Ware only recorded two sub-10 sack seasons in his career. Those seasons were his rookie year of 2005 and 2013. He attributes the decline last season to his personal health and that of his fellow defensive lineman in Dallas. 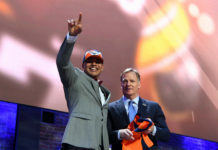 After the disappointing season he came to Denver in order to revitalize his career. Although many people said he was washed up and injury prone he had a great track record of consistency in his play. 2013 was the only season in his career in which he missed any regular season games. The tandem of Ware and Von Miller was immediately a source of excitement for the team. Since his arrival, Ware knew that Miller possessed some freakish talent and has been coaching him up ever since. He marvels at Miller’s size and speed and although he recognizes that Miller is already an elite pass rusher, he can’t wait until Miller can peak mentally with his physical attributes. The duo has combined for 24 sacks this year and has been everything they were advertised as. Ware was brought in for his leadership and mental approach to the game and it has clearly benefited Miller and others. As he casually roams the grounds at Dove Valley his calmness and maturity is a welcome sight amongst the younger group, especially on defense, yet the surprise is his transformation when Sundays arrive. When the ball is kicked off Ware ramps up the intensity and turns into a rare talent with the skill set of several greats that came before him. After he compared himself and his physical attributes closest to Jason Taylor it seems that according to his own comments, his mentality maybe closer to another great. 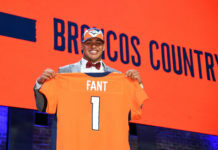 The Broncos are undoubtedly happy with his Zen-like demeanor off the field but more importantly are ecstatic to see his transformation when game time arrives. As the team prepares for the playoffs and the Indianapolis Colts on Sunday, Ware will need to bring his entire bag of tricks and football acumen with him in order to continue on his journey to greatness.